Recent innovations in information, analyses, and science-policy linkages can help guide the planet towards a more resilient future. For many of us when we think about the ocean, it’s a situation of “out of sight, out of mind.” In our limited awareness of the ocean, we see only the surface and think only of vast expanses of lifeless water, not realizing all of the complexities at play. In fact, the ocean provides over HALF of the oxygen that we breathe. It regulates ALL of our weather patterns, it feeds us, and it provides for our energy and economy. The ocean is a champion at absorbing human-derived (anthropogenic) CO2. Around half of all carbon dioxide produced by humans since the industrial revolution has dissolved into the world’s oceans. Coastal habitats store five times more carbon than do inland tropical forests. This has all helped to slow global warming. So in reality, the ocean is vital to all of us, no matter WHERE we live. But again, it is not out of sight, out of mind. The ocean is paying a price. All the absorption of CO2 is raising the acidity of the oceans, which will lead to the loss off corals and thousands of other species. Rising temperatures are linked to rising frequency and severity of storms, threatening Arctic habits, raising sea levels, and may enhance the release of gas hydrates on the seafloor. These factors along with reduced oxygen levels are all causing shrinking habitats and altering the entire food web in the ocean, placing fish at risk. Technology, particularly information technology, and within that the information technology known as geographic information systems (GIS) has long provided effective solutions to similar problems on land through innovations in information and imaging. Today, our mission is to take what we’ve learned on land and apply these innovations more effectively to the ocean so that we may build resilience and avoid collapse. The ocean presents some very challenging 3- and 4-dimensional problems. The ocean is very hard to access at full depth from sea surface to sea floor. Satellites and LiDAR, for example, while providing broad, comprehensive views of the surface of the ocean, can’t see all the way through the water in all places, and as a result, only 5 to 10% of the ocean is mapped in the same detail as on land. It’s a hard mission. But it’s a mission totally within our grasp. We are in an era of regional- to global-scale observation and simulation of the oceans. 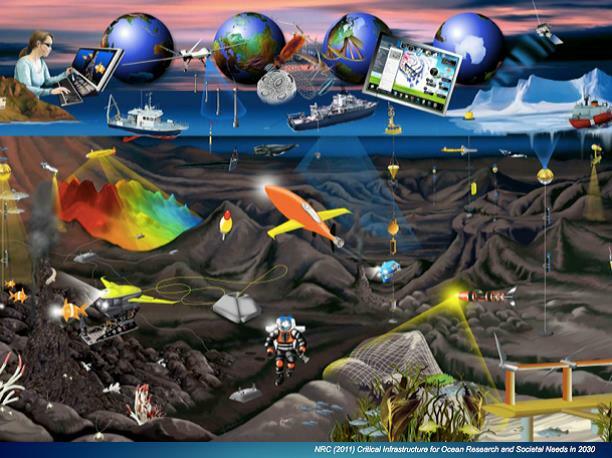 As an example from the world of ocean OBSERVATORIES, the graphic below from a recent National Academy of Sciences ocean infrastructure report, provides a look at the technology of today, as well as ~20 years into the future. These observatories programs produce big data. Big data are leading to a new science paradigm, a new data science that deals with, among many issues, the inundation of data from satellites, sensors, and other measuring systems and the issues associated with those large data sets. There is a growing ocean data industry to help meet this need. According to studies by Marinexplore (now PlanetOS), 80% of decision‐making processes in ocean science and business depend on data collection, management, processing, and distribution and the data acquisition market is currently $80 BILLION including ships, buoys, satellites, robots, ship-to-shore communications. The data management market will be $5 billion, including software and associated costs. There is further hope in the emergence of global initiatives such as the Deep Ocean Stewardship Initiative (DOSI), the Deep Ocean Observing Strategy (DOOS) as part of the Global Ocean Observing System (GOOS), and the Global Earth Observation System of Systems (GEOSS) which seek to address the grand societal issues of climate change adaptation, ecosystem conservation and sustainable resource management. These will be mentioned in the main talk. Creating and sharing knowledge toward effective action, and doing this through public‐private partnerships will also be key. For example, In June 2013, President Obama announced the Climate Action Plan, an effort to leverage data to help the American people understand and prepare for climate change. This blueprint for action includes the Climate Data Initiative, which encourages innovators from the private sector and the general public to convey data on climate change risks and impacts in compelling and useful ways that help citizens, businesses, and communities make smart choices in the face of climate change. One example is a public-private partnership between the US Geological Survey and Esri that resulted in the recent release of the world’s most detailed ecological land units map at a global scale (250-m resolution). This new global ecosystems map product, which portrays nearly 4,000 distinct terrestrial ecosystems of the Earth, provides scientific support for planning and management, and enable understanding of impacts to ecosystems from climate change and other disturbances. Among other benefits of our map, it fulfills one of the recommendations from the White House PCAST report on environmental natural capital. 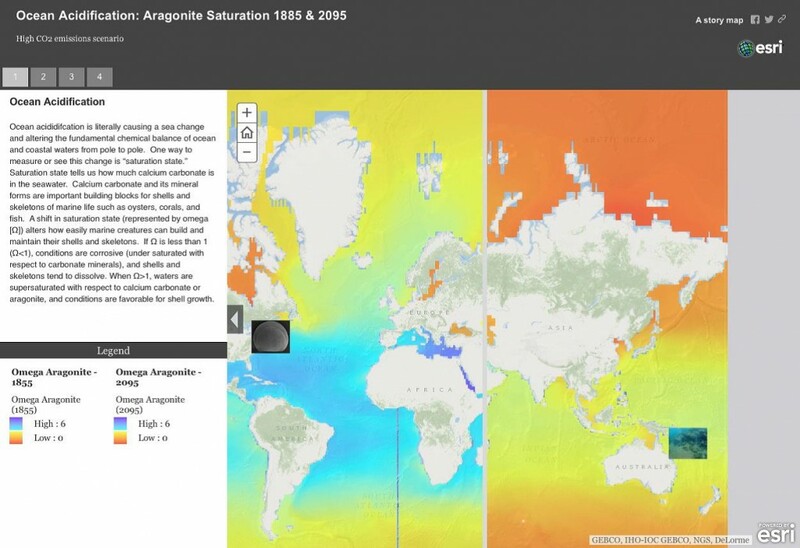 Work on a similar map of global ecological ocean units is now underway. Esri is actively participating to meet the challenge the White House has set forth. Resources shared at resilience.maps.arcgis.com and esriurl.com/resilientcomm are the combined contributions of Esri and the GIS user community (including government agencies and NGOs). 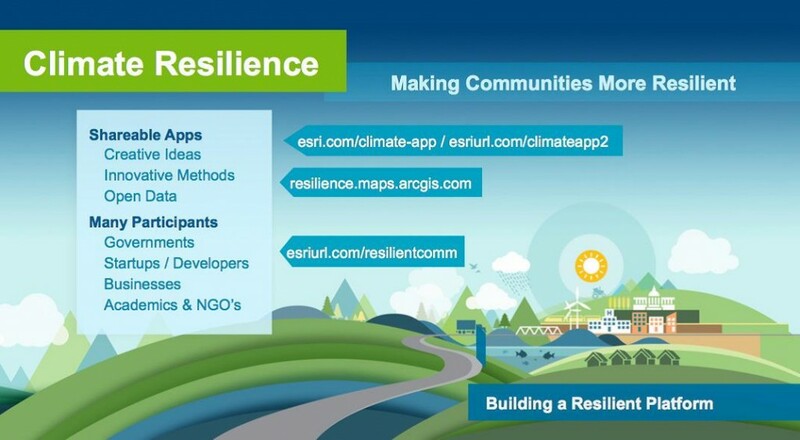 They provide maps, data, apps (including winners of climate resilience app challenges), interactive demonstrations, and other actionable resources, all with an eye toward inspiring people to address and solve climate resilience issues. There are many resources there for avoiding collapse in the oceans. There is also great power in storytelling, and the new medium of story maps that takes advantage of the power of interactive web maps and geography to educate, inform, and inspire people to action as well. A story map and related web app about the aforementioned global ecosystems project was released at the ACES 2014 conference in Washington, DC, in December 2014 after Interior Secretary Jewell made her announcement there about the President¹s Climate Data Initiative and related efforts. They generated quite a bit of media attention. A number of story maps exploring the ocean have also been developed, and adoption of this new communication tool has been growing at an exponential rate. Geospatial technology provides a set of innovations in information and imaging that connect cities, governments, and private organizations toward assessing their risk exposure and increase their overall resilience. Innovations such as acquisition of data from satellites and mining megadatabases now allow synthesis of environmental information to track human impacts at global to local scales. Analysis of such data provides new ways to identify macro-­‐ scale patterns and processes through long time periods. The emerging information highlights the speed at which humans are altering the biosphere, and offers opportunities for forecasting detrimental outcomes in time to avoid them. This is not JUST about your eyeballs on a map or on a series of numbers; it’s about looking at the invisible rubber bands of mathematical manipulation of these different layers. It‘s about COUPLING of the appropriate data, analysis, and compelling design to effectively communicate the scientific results, to transform scientific data into actionable information that people can use in their decision cycles to be more resilient to climate change and even to reverse its effect. To use the example of extreme weather, this can be critical for decision cycles in the short term (e.g., get in storm shelter now), medium term (e.g., evacuate), or long term (e.g., infrastructure planning as communities recover from Hurricane Sandy). The time is NOW for governments, communities, NGOs, and universities to go beyond just an exploration and discussion of ideas to using these technological tools to rapidly prototype and deliver repeatable solutions that we all can use to help guide the planet towards a more resilient future…before time runs out. This post is based on my presentation at the Avoiding Collapse: Human Impacts on the Biosphere Symposium, AAAS 2015, San Jose, California.